The Barrow County website has announced their Barrow Kid’s Wellness Day. 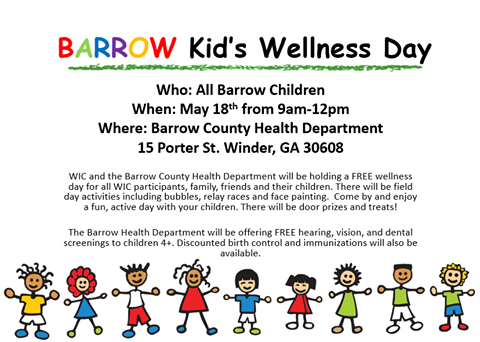 The Barrow County Health Department and Barrow WIC will be holding a Kid’s Wellness Day on May 18th from 9am to 12pm in the Health Department Parking lot. All families in Barrow County are invited to join. There will be field day activities, face painting, Kid’s Zumba and raffles. Door Prizes include children’s bikes, restaurant gift cards and a manicure for mom. There will also be healthy, kid friendly refreshments. ← Look At Statham Elementary Grow!